Josh Griffiths of cesar Australia and Tamielle Brunt of UQ taking water samples at Moggill Creek. 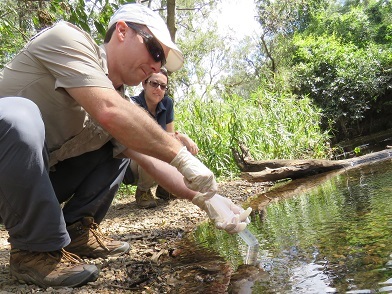 Earlier this month in a first for WPSQ, PlatypusWatch Network collected water samples from a range of creeks from Caboolture to the Gold Coast in an effort to remove some of the secrecy around the species’ survival in the greater Brisbane region using the cutting edge technique of environmental DNA (eDNA) sampling. As part of PlatyCount 2016, Wildlife Queensland is collaborating with cesar Australia to update Queensland’s platypus distribution data by combining traditional observation surveys with the latest in what aquatic wildlife monitoring has to offer. “There’s a sense of quiet privilege in being privy to the sight of a platypus in its natural environment. Secretive animals are often the most rewarding to spot, and our native platypus is certainly no exception,” said Projects Manager for WPSQ, Matt Cecil. “Yet it’s the secrecy of these animals that makes their conservation that much more difficult. If we don’t understand in which creeks the species exists, how can we know where to focus our efforts to conserve it?” he said. Josh Griffiths, ecologist and platypus expert for cesar Australia was in Brisbane recently to discuss the process and benefits of eDNA sampling with representatives of Brisbane’s regional councils, NRM groups and other environment organisations. Josh’s seminar provided an overview of platypus concerns and conservation as well as a breakdown of the application of eDNA in surveying for aquatic wildlife. As part of their everyday activity, aquatic animals shed DNA from their bodies which is dispersed via water movement. The process of eDNA sampling involves collecting simple water samples and sending them for processing to a diagnostic laboratory where the DNA is then extracted if present. When comparing the time costs involved in the two surveying methods, eDNA sampling makes a lot of sense. A single person can collect (and therefore survey) water samples from multiple creeks and catchments in one day. While conversely, much coordination and many people are required to conduct an observation survey of one creek alone. However, traditional observation surveys are still, and will always be, a part of PlatypusWatch. No number of water samples can match the awe inspired by actually seeing a platypus swimming in a creek. As part of PlatyCount 2016, over 60 community members have attended early morning surveys where eight platypuses have been spotted. The understanding, conversation, education and knowledge sharing experienced by those who attended is why these types of events will always have a key role to play in Wildlife Queensland’s projects. Further, eDNA surveying comes with a price tag. There are costs associated with the collection of water samples, and even greater costs associated with their laboratory analysis. Gratefully, PlatyCount 2016 has received generous funding from Wildlife Queensland donors, Healthy Waterways and Catchments, Moreton Bay Regional Council, Redland Regional Council, Ipswich Regional Council, Logan Regional Council and the Gold Coast Council with which to give this cutting edge advantage to our tried-and-true techniques for observing and conserving this elusive native species.